Shinji Tanaka, MD, PhD, from the Department of Endoscopy at Hiroshima University Hospital in Hiroshima, Japan, discusses his Original Article “Endoscopic prediction of deep submucosal invasive carcinoma: validation of the Narrow-Band Imaging International Colorectal Endoscopic (NICE) classification” from the October issue. Using the Narrow-Band Imaging International Colorectal Endoscopic (NICE) classification, we can detect submucosal deep invasive carcinoma, which is not indicative for endoscopic treatment because submucosal deep invasive carcinoma shows high risk of lymph node metastasis. Using NICE classification, we can correctly select the patients from those with early colorectal carcinoma who should go to surgery. Figure 1. 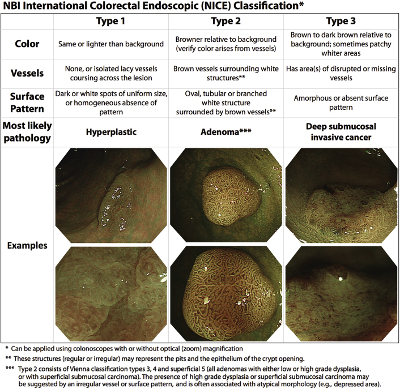 The NBI international colorectal endoscopic (NICE) classification. We need to prevent meaningless endoscopic treatment prior to surgery for early colorectal carcinoma in the aspects of curability, safety and cost benefit. Using NICE classification with NBI we can easily get the precise characterization of early colorectal carcinoma without specific agents and equipment, such as indigo carmine, crystal violet, and endoscopic ultrasonography. NICE classification is a basic classification of NBI for colorectal neoplasia and this provides useful information in daily clinical colonoscopy.